Cost: $80 for an 8 week session, a family-friendly price to try this exciting sport! Loaner Equipment Handout* while supplies last - Details will be sent prior to the first session. An $80 refundable deposit is required. Includes helmet, shin guards, elbow guards and gloves. Equipment is available for loan. Limited Quantities Available and distributed on a first-come, first-served basis. Equipment includes: helmet, gloves, shin guards and elbow pads. You must provide: skates and mouth guard. A fully refundable $80 deposit is required at the time of pick-up. 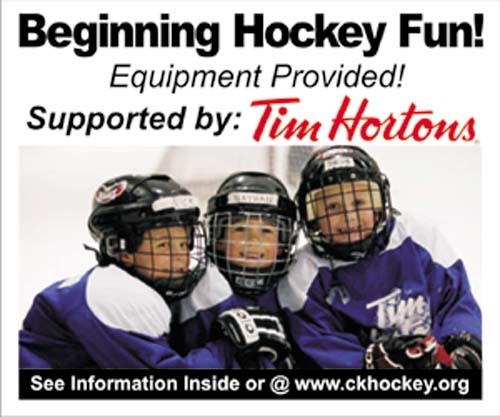 Hockey skates can be rented at the Civic Center or new/used hockey skates can be purchased for a nominal fee at various stores.